The truth is one. Truth is eternal. It is beyond time and place. Bhagavatam begins and ends with the words; “May we meditate upon this truth” (Satyam Param Deemahi). Though there are great scriptures like Upanishads, Bhagavatam and Bhagavad Gita and though each one revealed in different ways, they all arrived at the same truth. Though they came in different versions, the underlying truth remained the same in all their works. The Upanishads say; “that which exists is ONE, sages call it by various names (Ekam Sat Vipra bahudha vadanti). Though they appeared to tread different path, they all sought to reach the same end; the liberation. Many saints like Sri Guru Dakshinamurthy, Sri Ved Vyasa, Sri Adi Sankara appeared in this holy land and brought about a spiritual awakening. They came as Guru to remove the veil of darkness and to reinstate the truth; ‘Aham Brahmasmi’ (I am Brahman). Arunagirinathar too came in the glorious lineage of Gurus with a view to remove the darkness and elevate humanity to the realization of the divinity within. Though Arunagirinathar presented us with the ideal form of worship, the Thiruppugazh, it underlined the same truth, the Advaita Vedanta, which Adi Sankara postulated. We find glimpses of Advaita philosophy at many places in Thiruppugazh. Throughout Thiruppugazh we find the principle of oneness. He did not find any difference between Hari and Hara. Just as Adi Sankara, Arunagirinathar also embarked on a long pilgrimage and visited temples and met saints. In the song rendered at Kasi (Dhaaranikathi), Arunagirinathar seeks the blessings of Lord Viswanatha to be able to go beyond the realm of body and mind and attain knowledge by which he would be able to experience the Muruga within. The Manisha Panchakam composed by Adi Sankara conveys the message that he who goes beyond bodily concepts like caste attains Self knowledge. We find glimpses of Advaita philosophy in many songs of Arunagirinathar. Just as Sankara’s ‘Viveka Chudamani’ paves the way for liberation from this world of illusion, Arunagirinathar’s thiruppugazh also opens the door for Jnana, the way towards ‘Amritatvam’ immortality. In Kandhar Anubhuti, he describes Muruga as Brahman, without any attribute or quality. “Muruga has no form but he is not formless either. He is not present but he is not absent either” (Uru anru aru anru, ulathu anru ilathu anru..). In another verse, he says: “Oh Lord, my individuality having been swallowed by you, I have become one with you”, (Yaanakiya Enai Vizhungi Verum Thanai Nilai Ninrathu Tharparame Kandhar Anubuti 28). In his Swami Malai song, Arunagirinathar prays: “Grace me the knowledge that you are not different from me” (Naveru paa manatha). Here, the poet implies that the Self (Atman) that shines in one is the same that shines in others. 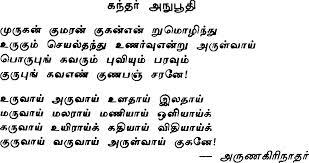 In the song rendered at Tiruchendur (Iyalisayil..) Arunagirinathar says: “Oh Lord, open my inner eyes so that I will be able to see you within me”. In “Perutha Vasana Vakuppu’ which shines as the crowning glory of all Arunagiri’s works, he says: “The Mahavakya symbolizes the state where all thoughts that arise from mind and all actions that arise from body are controlled, where the illusory world of forms and images subside, where silence alone prevails resulting in peace and bliss. The four Great Words of Truth (Perutha Vasanam), Tat Tvam Asi (You are That), Ayam Atma Brahma, Prajnanam Brahma, Aham Brahmasmi convey the truth that the divinity (chaitanya) within the individual is the reflection of Brahman, the eternal reality. Thus we find that basically, Arunagirinthar was an Adwaitin. He did not believe in any difference. He saw Muruga as another form of Siva and as related to Lord Vishnu. He saw all Gods having different forms as manifestation of one reality, the Brahman. He gave the message that God is not anywhere outside but within. Thiruppugazh is like Kalpaka Vriksha, (Karpagamena vinai kadithekum….Kaithala), a wish-full-filling tree which gives whatever the devotee asks for. In fact, by reciting Thiruppugazh, a devotee gets blessed with whatever he thinks best for him. (Avar avar ichayil evai evai utrana), but that is only the first stage. From being blessed with whatever he thinks best for him, he ultimately gets blessed with what Muruga thinks best for him; to liberate him from the morass of repeated life and death. Thiuruppugazh gives him the nectar by which he does not have to come back to this world of sorrows, the nectar by which he attains immortality (Amritam Gamaya). Having been a student of Thiruppugazh for many years, I thought that by the excuse of a book, I can learn more and hence this attempt. I have selected certain songs which dealt with the question of liberation (Mukti) and made an attempt to interpret the verses from my own limited understanding. I have done the commentary purely from the point of view of a seeker or a student. Thiruppugazh is meant to be rendered in harmony with Raga, in rhythm to thala, with full knowledge of the meaning and with full devotion (bhava). It is rare to have combination of all these qualities in one person. A devotee may not have the skill in music. A devotee may not have the full knowledge of the meaning. How such a devotee would adopt Thiruppugazh as his means of worship? “It is enough”, Guruji used to say “if you just listen. Prahlada, the embodiment of devotion ranks ‘Sravanam’ (listening), among the first nine ways of attaining liberation (Srimad Bhagavatam). You may not be able to sing in accordance with Raga, you may not be able to comprehend the meaning. It is enough if you lend your ears. It is enough if you attend a Thiruppugazh satsang. It is enough if you be the part of Thiruppugazh culture which kindles the spirit of devotion in your heart and elevates you to the experience of the presence of Muruga within. Whatever little gems and pearls that we collected from this vast ocean of Thiruppugazh, we decided to share them with other devotees through the book, “Thiruppugazh, Glory to Lord Muruga”. Though this website was launched to introduce the book, it continued to survive even when all the books were sold out. It continued to be the medium to highlight the glory of Muruga through the verses of Sri Arunagirinathar. We are delighted to have you as a visitor to this website and we pray Lord Muruga to bless you not necessarily with all that your mind wishes but certainly all that your heart, the abode of Muruga, wishes.